Our story began in the spring when a huge, thick, black cloud grounded air travel around the world while the capricious Icelandic volcano erupted with all it’s might into the sky. Gone the roar of jet engines. here was no more transatlantic travel for business or pleasure alike. We had only the immensity of the situation, the sky and it’s plumes of smoke and ash and the imminent threat to our return to France. Only days before we felt as if the world was on offer to us, thoroughly enjoying countless adventures while staying in Manhattan. Ralf and I had planned to spend our last few days at our friend’s house in upstate New York, near the Hudson River. We were excited like young children at the thought of ending our stay immersed in music, up close and personal in the company of an extraordinary musician and friend, KJ Denhert. 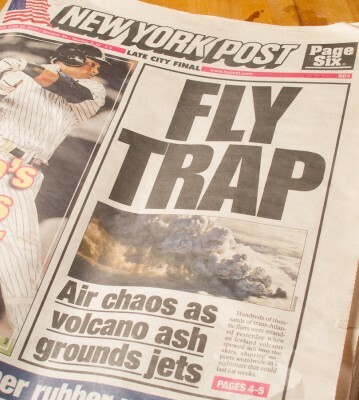 On Monday the KJ drove in to the city to pick us up at our hotel in Tribeca, stunned by the news that was flooding the airwaves from every direction: planes were forced to remain grounded at several airports across the US and in Europe, due to an enormous volcanic cloud which reigning indefinitely and arrogantly in the sky. We didn’t react right away, nor did we realize the consequences of this force of nature. At that point, we were mostly looking forward to the music and the company of our wonderful friends who opened their home to us. The days passed and threatened us with imposed no-fly zones, like an open parentheses, we had no idea when we would be able to go home! KJ tried everything she could to get accurate information about the weather and still enjoy the extra days with us. We were lulled by our shared time, talking and processing together, excited by the unpredictable, persnickety volcano. KJ’s friend, Bettina asked us: “So, what would you do if you could never go home again?” Thank you, Bettina, for that inquiry. Perplexed by the question that turned out to be a very personal one, something became clear: we could not pick up where we’d left off with our prior activities. Forced to imagine what we would do, it was suddenly obvious, that we wanted to share some part of what lives inside us, our love of music, of rich flavors, of shared moments. “Bouillon of Notes” was born. My name is Lien and my wonderful and talented friend and husband’s name is Ralf. I grew up surrounded by lovers of taste, in a place where time spent preparing meals for loved ones was as precious as the time we shared with them, where the exchange of culinary culture – Asian, French, Italian – excited our palettes with a multitude of flavors: spiced, fragrant and traditional. I would hear my grandfather’s footsteps coming from the kitchen in the early morning. He was a baker and he would bring me madeleines laced with orange blossom water, and give them to me for breakfast when I awoke. A white apron tied around his waist, he would sit next to me and talk about the magic of rising dough, the folding of puff pastry, the resting time for each process. To tell the truth, I didn’t understand much, but I neve grew tired of listening to him, so entranced was I by the aroma of the madeleines and croissants that baked in the oven. This is what I remember from my childhood. I learned to recognize and appreciate the time it takes to do the things that I loved. I learned respect for the time it takes to prepare meals and share them. Ralf is all smiles, joie de vivre and in love with music. From an early age, he spent hours sitting next to his aunt who played piano, with his gaz fixed on the dizzying display of fingers flying across the black and white notes. His curiosity peaked. He was filled with rhythm and musicality and ever since. Early on, he learned to play many instruments, but the one that caught his fancy was the bass guitar and it’s still by his side to this day. Or should I say the bass guitar chose him and conquered him. The bass opened him to the universe of jazz musicians and Jazz itself, where the freedom to play the instrument nourished him and invited him to listen to other types of music, other rhythms. Through music he traveled the globe, to listen to musicians from around the world. He and his musician friends would study different pieces to take on the road with them, to get ready for the concert they were going to attend. And then: New York City, cradle of creativity, which flabbergasted him with its wealth of music and culture. He got closer to musicians, learned from their performances and returned to Europe, his heart full of new projects. It is the chance encounter of a taste for life and the sharing of music that has given birth to Bouillon of Notes. It’s thanks to the many impromptu sessions, discovering, listening and enjoying, that we’ve been inspired to share a little of ourselves with you. It’s about those precious moments in Upstate New York when KJ would give us an advance taste of her new songs between a chocolate cake and an apple tart. It’s also about those times in my kitchen when I pass down my recipes to my children. Here on our site, Bouillon of Notes, we would like to share these moments through music with a hearty appetite for the rich taste of life we know, with infinite respect and gratitude.